Anna’s dream is to take the Reach Out to Horses® program around the world, especially to Third World countries, to make a difference in the lives of the working horses and people that are unable to travel to the U.S. Anna is an internationally respected horsewoman, clinician, coach, certified animal communicator & healer. She has conducted clinics, classes and training sessions in Australia, Canada, Denmark, England, Germany, France, Holland, Sweden, Spain and throughout the United States. Anna’s early love of horses bloomed through her relationship with her own childhood horse, Ringo – and then as an adult with Carrie, a Thoroughbred Irish Draught mare. She and Carrie entered competitions, including show jumping, long distance riding, and cross-country jumping; as well as assisting at local riding schools with trail rides and remedial horses. Qualified as one of the first 6 instructors throughout the world, Anna was the first person ever to be entrusted with the title of Head Instructor at the MRILC and the only Head Instructor to be a member of the MRIA Board. Anna was a member of the Development team and the originator of several Monty Robert’s courses. She supervised instructor courses, numerous introductory courses and clinics. She wrote the standard exams for both the introductory and instructor courses and has been instrumental in graduating 10 instructor students, as well as being a member of the MRIA Board of Directors for a number of years. During her tenure Anna assisted Monty in compiling the information used in his book, ” From My Hands to Yours” and has conducted numerous demonstrations to the public at the MRILC and assisted Monty during Pomona Equine Affairs. 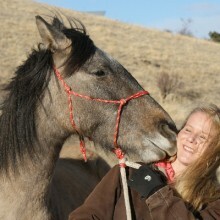 Anna has also worked in collaboration with other leading clinicians on natural horsemanship on animal communication. Beyond her own equine training and experience, Anna has explored a plethora of “alternative” healing modalities over the years, including becoming a certified Reiki Master and Intuitive Healer. She has studied Equine Herbal Natural Remedies and Aromatherapy, is a certified Reconnective Healing® Level III practitioner and most recently graduated from Carol Gurney’s HeartTalk Program® as a certified animal communicator. One of Anna’s great passions is the survival and protection of wild horses, and she has been privileged to observe brumbies in their natural habitat in Victoria, Australia along with colleague Eric Godward. She also assisted Neda DeMayo in Santa Ynez Valley at the wild horse sanctuary Return to Freedom for a number of years. RTF is home to the American Wild Horse it is considered a living museum by providing a natural environment horses live in herd groups and students can observe natural wild horse dynamics. Anna was part of the education program and played a significant role in gentling mustangs for special care and foster homes. Anna continues to support a number of Charities including Equine Voices Rescue and Sanctuary in Tucson, Arizona, where she is actively involved as an Advisory Board Member.